Inside the world of a passionate producer and engineer on a mission to bring production excellence to artists and events. 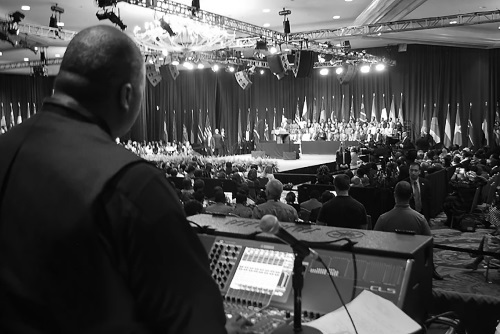 LaGrand beyond the console for an event feature U.S. president Barack Obama. LaGrand grew up a preacher’s kid, a preacher’s nephew and a preacher’s grandson on both sides of his family. As a musician, he played in church from the 1970s through the 2000s, only stopping when he started touring as a front of house mix engineer and could no longer commit fully to rehearsals and Sunday services. In addition, he opened LaGrand Enterprises in December 1996, bringing together his two passions and affording him the opportunity to assist his clients in producing excellent projects and productions. 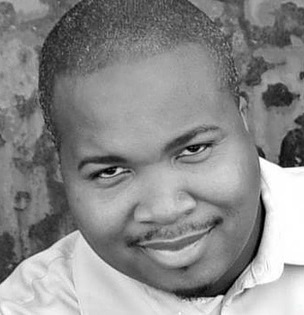 Along the way, he was named the 2012 Producer Of The Year by the DMV Christian Music Awards, was a nominee for the same award the following two years in addition to being the 2014 Pioneer Award honoree. As a child, LaGrand was usually allowed to listen only to gospel music. At the age of eight when riding in the back seat of his parents’ car, he heard something else on the radio and immediately noticed an extreme difference in the production quality. Asking about the disparity, he was told that gospel artists usually don’t own their own companies and receive scraps for production. At that moment he vowed to help change that. Earning a Recording Engineering degree from Full Sail University in Orlando helped put him on the path to helping numerous artists get their messages out, in addition to stints providing sound reinforcement for every U.S. president since Ronald Reagan. In addition, he and business partner PJ Morgan have written and engineered music for dozens of television and award shows out of his studio (TruReign Recording Studio) since the late 1990s. I first met LaGrand while working with Chuck Colson’s Prison Fellowship in the mid-90s. We developed an immediate camaraderie since we both possessed similar qualities: passion for delivering quality sound combined with strong backs to manhandle the largest systems on the prison tours. We recently reconnected and he provided me with a glimpse inside his world of large-scale productions hosted within churches. Erik Matlock: What aspects of live production would you consider your specialty, and what might you do a little differently from others? LaGrand: I’ve always searched out processes for getting things done in the best way possible with the least amount of hiccups. Either I learn all aspects to a certain extent or I make great relationships where I can garner the knowledge or help when needed. In my career, I’ve done everything in live production, covering audio, lighting, video and management. Even though I have a degree in recording engineering, it was never my intent to be just a studio engineer. I’ve always had the bigger picture in mind even as I developed my skills as a front of house engineer. As I learned more I made a concerted effort to pay attention and get involved, take notes and build relationships with all areas and levels of live production. I believe that skills and talent will only take you so far, but your attitude and personality can take you a lot farther. With most artists and engineers, I would dare to say that a lack of talent or skill isn’t their issue. It’s their attitude, professionalism, and/or their unwillingness to learn perpetually. Remember, everyone wants and needs to look good in their roles. If someone chooses to have you as an intricate part of a very important event, that means they believe you can help them look great. Don’t let them down. It’s always about service to others. I always thank my clients for the opportunity to be of service to them and their client’s vision.